This month, more than 550 hot-air balloons will take to the skies during mass ascensions, Balloon Glows, and Special Shapes Rodeos at Balloon Fiesta Park, in the Duke City. With more than 800,000 visitors expected to attend from October 6 through 14, we want to heighten the odds that your experience takes flight by imparting this local savvy. General admission ($8) grants access to the best experiences on the field—watching hundreds of towering hot-air balloons inflate, their envelopes forming colorful canopies before they take flight. Visitors looking for more in the way of creature comforts—including guaranteed seating, otherwise a rarity on the field—should look into the Chasers and Gondola Clubs. A Chasers Club pass ($25 each visit) offers patio seating, a breakfast burrito or hamburger, and a cash bar for cocktails. The Gondola Club ($120 first visit, $60 each additional visit) provides a VIP experience with parking, patio seating, a buffet, an open bar, a souvenir lapel pin, and perhaps the most coveted on-field amenity: private restrooms with flush toilets. Local bands perform in both clubs during the evenings. When locals can&apos;t make it to the field, but can&apos;t resist the magical quality of balloon-dotted skies on Fiesta mornings, they head to the best off-site viewing locations: west of Jefferson Street, between Osuna Road and Paseo del Norte Boulevard; or Pan American Frontage Road (off I-25 N.), between Paseo del Norte and Alameda boulevards. Any area with a good sight line will provide a great experience. Just be sure to carefully pull off the road before you sky-gaze. Located in the Northeast Heights, Nativo Lodge is in a prime viewing spot a few minutes away from the field and close to a Park-and-Ride location. Western-exposure rooms at this Native American–themed boutique hotel offer the experience of sitting in a box at a baseball game: Just pull back the drapes to get your own private balloon show. Downtown, the newly remodeled Hyatt Regency Albuquerque offers a package catering to Fiesta travelers that includes well-appointed accommodations, tickets for two days to the event, transportation to and from the park, and a box breakfast for two each day. Both hotels cater to Balloon Fiesta pilots; during off hours, you may find yourself mingling with them in the lobbies. Nativo Lodge: From $139 per night (during Balloon Fiesta). 6000 Pan American E Fwy. NE. (505) 798-4370; nativolodge.com. Hyatt: Up, Up and Away Package, from $239 per night for a room with a king bed. 330 Tijeras NW. (505) 842-1234; albuquerque.hyatt.com. Now is not too early to plan for 2014—hotels and services are often booked solid months in advance. The downtown skyline and the Sandía Mountains bookend the views from Bien Shur, on the top floor of Sandia Resort and Casino. 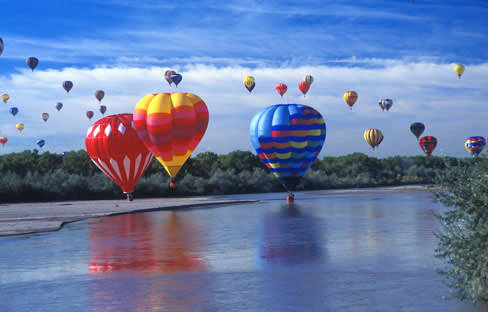 During Fiesta, the restaurant also offers views of the Balloon Glows, when the balloons are tethered to the field and fire their burners to wash the field in light. This is also a great spot for stunning views of the post-Glow fireworks show. Standouts from the fine-dining menu include slowly cooked short ribs and a variety of steaks and chops—a much finer (and warmer) dining experience than on the field. Bien Shur: 30 Rainbow Rd. NE. (505) 798-3700; sandiacasino.com. Operated by Jesse Herron and Mike Silva, two fun-loving Burqueños with plenty of local pride, the Albuquerque Trolley Co. takes visitors on guided tours to evening Balloon Glows. The tour includes transportation to and from the Albuquerque Convention Center in the open-air, stucco-covered (yes, really) trolley. The $50 tour includes admission to the on-field Chaser&apos;s Club and a chance to win a Tootsie pop during the onboard trivia games. Visitors with pedal power also have a new transportation option: If you bike to the park, local volunteers from Bike ABQ, the New Mexico Touring Society, and the Albuquerque Parks and Recreation Bike Safety Program valet your ride while at the park. The service is free. For more info, contact volunteer coordinator David Candelaria, candelaria@bikeabq.org. Contributing editor Ashley M. Biggers enjoys all of the hot-air balloons at AIBF. However, the special shape Spider Pig is her new favorite.